Sometimes the weather doesn't completely cooperate. That was the case in Cape May today. A cold front passed through the region last night, and the North or Northwest winds the follow most cold fronts will usually bring a lot of migrants into Cape May. But the winds switched very quickly to the East this morning, and while we saw a few monarchs coming into Cape May, it wasn't the big day that some of us were hoping for. Birders in Cape May enjoyed a reasonably good day with songbirds and raptors, but it was those east winds that brought the biggest surprise. Around midday, a pair of naturalists, including our project's Field Coordinator Louise Zemaitis, discovered a Whiskered Tern in Cape May. This old world species had only been found in North America twice before. No doubt those persistent east winds helped this bird travel across the Atlantic. Whiskered Tern on the beach at Cape May Point. Of course you're here to learn about monarchs, not rare birds. So if today was another okay, but unspectacular day for monarch migration, what do we think is coming up? Saturday's forecast is for more east winds, and a 50% chance of showers. Monarch numbers will probably remain steady. Saturday will mark the first tagging demo of the season, however. 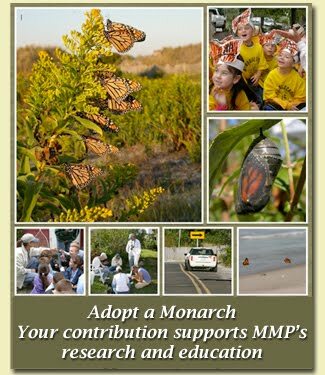 Join us at Cape May Point State Park at 2:00 pm to learn more about monarchs and to watch us tag a few and send them off towards Mexico. We meet in the East Shelter, which is right next to the big Hawk Watch platform. There's no cost for this program, though (of course) you're welcome to contribute to our project if you wish. Sunday's forecast has us excited again. Right now the meteorological prognosticators are calling for mostly sunny with northwest winds from 10 to 15 miles per hour. The type of weather that's most likely to bring good numbers of monarchs to Cape May. We don't know how it will pan out, but our promise to all who care about monarchs remains constant: we'll be out there, counting and tagging, and we'll report back here with the latest news. We also report via FaceBook, be sure to follow us there if you don't already: https://www.facebook.com/CMMonarchs. Our project continues to be a resource for journalists. Grid Magazine, whose tagline is, "Toward a Sustainable Philadelphia," has an article on butterflies in its October issue that features the MMP. You can see it online here. Scroll through to page 16. I'm not sure when the print edition will be available, though I know it will be very soon. We have also been covered in a brand new article on the Star Ledger's website, nj.com, that showed up online this evening: read it here. The latter article was probably triggered by a press release sent out earlier today from NJ Audubon's Conservation Department about proposed legislation in New Jersey designed to help monarch butterflies. Thanks to NJ Audubon Conservation Advocate Megan Tinsley for working hard to get the word out on these proposals. We'll close this post with the full text of this press release. Monarch butterfly populations have declined by more than 90% in the past 20 years. This species is unique among butterflies in making incredible transcontinental migrations from Canada and the United States to wintering grounds in Mexico. The Monarch Monitoring Project is a research and education program run through NJ Audubon’s Cape May Bird Observatory that collects data on the hundreds of thousands of Monarchs moving through Cape May each September and October. Weighing a mere half gram, Monarchs traveling the Atlantic coast on a 2000 mile journey to Mexico become concentrated in Cape May before crossing the Delaware Bay, allowing for census counts and tagging individual butterflies in order to provide a better understanding of their movements. September marks the 25th year of the Monarch Monitoring Project fall migration surveys in Cape May and public tagging demonstrations begin tomorrow. As the season kicks off, New Jersey Audubon is also supporting the adoption of a suite of bills introduced in the New Jersey Legislature this summer that aim to help Monarchs better survive. Two bills are focused exclusively on Monarchs, while others will benefit a host of other pollinator species through enhanced awareness and improved habitat conditions. Milkweed—the plant critical for Monarch survival—is not a weed, but rather a native perennial plant that provides both food for Monarch caterpillars with its leaves, and nectar for adult butterflies through its bright flowers. As Monarch caterpillars will not feed on other plant species, they depend on the availability of milkweed to lay their eggs so the caterpillars are provided a food source. Milkweed abundance has declined substantially as a result of widespread herbicide use in agriculture, loss of agricultural lands and open space to development, and landscaping practices that favor short lawns rather than taller, native vegetation. Widespread loss of milkweed has been linked to Monarch decline. One bill introduced this June will establish an “Adopt a Monarch Butterfly Waystation” (A3353) to provide resources and coordination for planting milkweed on public lands and parks, while the “Milkweed for Monarchs” (A3352) program will focus efforts on drainage basins that could provide ideal growth opportunities for milkweed in otherwise unused areas. An “Integrated Roadside Vegetation Management Program” (A3354) will create better habitats for flowering plant species such as milkweeds and others that provide sources of nectar along our highways. Current mowing regimes cut plants before they are able to bloom and provide nectar for butterflies and other pollinators. New Jersey Audubon also supports legislation that will improve habitat for Monarchs and other wildlife by removing barriers to property owners cultivating habitat—including flowering plants such as milkweed. The Private Wildlife Habitat Certification bill (A3133) would provide homeowners with an affirmative defense against nuisance complaints and code violations arising from providing habitat for wildlife by way of native vegetation that provides sources of nectar, seeds and berries. 30 percent of land in New Jersey is considered urban, including lawn areas such as office parks, golf courses, athletic fields and residential yards. To learn more about the life cycle and migration of Monarchs as well as efforts to tag the butterflies in Cape May, members of the public are invited to attend Monarch Monitoring Project tagging demonstrations (weather permitting) Fridays, Saturdays, Sundays and Wednesdays from September 20 to October 12 at Cape May Point State Park. The demonstrations begin at 2:00 at the East Shelter, the picnic pavilion next to the Hawkwatch Platform. The Nature Center of Cape May is offering tours of private butterfly gardens that support Monarchs in Cape May County on September 19, 20 and 21. Details are available at njaudubon.org by selecting Nature Center of Cape May under the Centers tab. Exhibits with live caterpillars, chrysalis and adult Monarchs are on display at the Nature Center of Cape May and the Cape May Bird Observatory’s Northwood Center. Additionally, weekly butterfly walks are held at the Center For Research and Education in Goshen on Thursdays at 10:30 now through October 9.. Details on all butterfly and nature programs are available at njaudubon.org by viewing the events calendar. For more information on the Monarch Monitoring Project or to adopt a Monarch, visit monarchmonitoringproject.com.